So how do you decide which multimedia platform will shine a light on your content? Start by using the following advice to learn how to communicate with your audience in a way that will reach them. Here’s a quick comparison of the benefits of each media before I go into further detail. This seems simple, but it’s easy to get excited about different channels and carried away with new tech. If you have charts, presentations, infographics, or video – choose a presentation channel that is visual like a webinar. The combination of audio and video will create a greater impact than an article or webpage would alone. You can add your own twists or insights on information, essentially offering your own explanation to the data that might otherwise be missed in a traditional media format. In addition, one of the biggest benefits of webinars is the ability to present this info live. Most web companies run more than 1 webinar a month (as of 2012). On average, people from 2 countries take part in a webinar with a total of 28 participants. Most webinars are held on Tuesdays between 11 am and 3 pm. Check out more information on webinars with the e3 explanation and the original graphic by ClickMeeting. Remember, to get the most out of webinar attendance, you’ll want to have your resources ready ahead of time from presenters to data to camera person. There is a large variety of webinar software available in the cloud to meet most price ranges too. Create a demand gen plan to amplify attendance and hype for the upcoming event. Another handy fact about webinars is this – Newfangled notes, “most one-hour webinars will yield approximately 8,000–10,000 words of indexable, educational content.” What can your business do with 8,000-plus words of research and insight? And finally, create a podcast. If you have quality recorded audio, you can create a podcast that is available on multiple platforms like iTunes and Podcast.com. 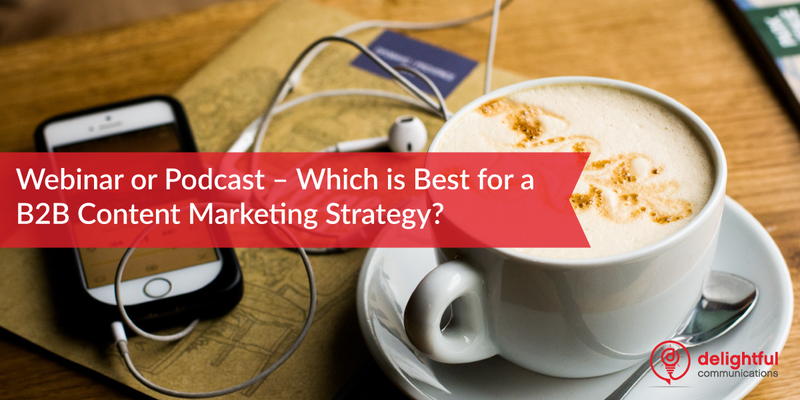 Podcasts are excellent for providing on-demand content to your audience. You can package this info into episodes and these episodes can be listened to offline – no Internet needed. These episodes can also be listened to over and over again in cases of instructional content that may take a little more time. Require fewer resources than a webinar (especially if repurposing content). Help the listener create a personal connection to the speaker, adding to brand trust. 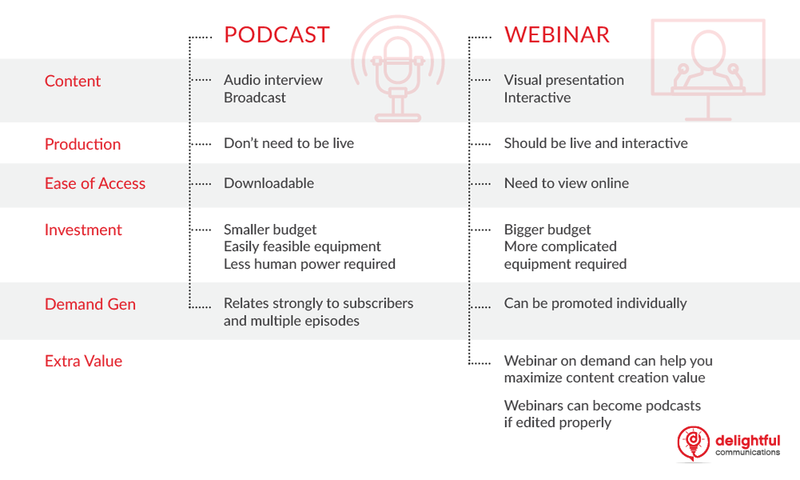 While there are clear advantages to both webinars and podcasts, the choice is up to you and your business needs. However, the benefits are clear for jumping into these multimedia waters. Many organizations want to share their innovative solutions to complex problems. When there is an additional depth to this information, a standard blog post just won’t cut it. Big data, market insights, and deep development knowledge require nuanced explanations that need that little “something extra.” To understand the necessity of a podcast or webinar, it helps to understand how to present complex information. Dr. Emily Grossman is a molecular biologist who helps train scientists how to communicate. Clear communication techniques are key. Engaging audio and visual messages with a polished delivery will go a long way. She notes, however, that, “You can’t hide poor or boring content behind a charismatic delivery technique and expect your audience to let you get away with it.” To solve this problem, Dr. Grossman advises taking the time to get the content right. While you may be excited about all your data, your audience will relate more strongly to key insights and digestible portions of information. Lifehacker understands how explaining tech to non-tech people can add an extra dimension of difficulty. They recommend finding ways to make this information matter, such as playing to your audience’s desire for security, privacy, or simplicity. Begin complex explanations by starting with details people already know. For example, if someone doesn’t understand the concept of a blog, try calling it an “online magazine.” Use the information you know about your audience to tailor your content in ways that will keep them awake.